We will discover the Mexican history by driving through its 4 oldest neighborhoods, enjoying the different architectures, bohemian vibes, and lovely parks. The epicenter of hipster subculture in the city, the neighborhood streets are lined with restaurants, bars, clubs, shops, cultural centers, churches and galleries. Also knew it as the little Europe, this neighborhood is surrounded by art nouveau architecture. It used to be an aristocratic residence until the revolution. Nowadays it's full of secrets, restaurants and bars that only the locals know. Mexican food is known all around the world and is one of the biggest success stories of our country. But what most people don't know is that it's more than Tacos, Burritos and Enchiladas. Our goal is to show you some different tastes of Mexican cuisine, with origins in the pre-Hispanic past. The food you will try is very carefully selected by us and there is always a vegetarian option at hand. You will dive with us into moving markets (tianguis) and turbulent mercados, as well as a very modern interpretation of these. From our own experience of traveling around the world, we truly love to discover new cities by bike. To deliver you the most enjoyable bike ride through the bumpy streets of CDMX, we buckled up with our friends from Tropical Bikes, a bicycle manufacturer in Mexcio City. They hand made these black cruising bikes from scratch. We will also provide helmets and locks. 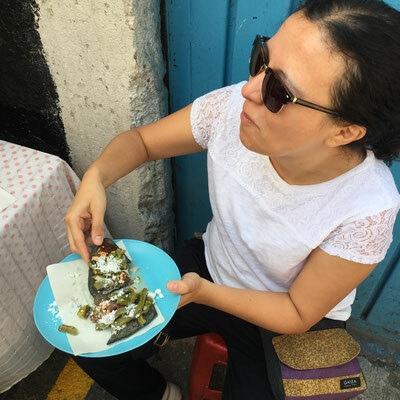 Paola, born and raised in Mexico City – a chilanga, as the locals say. She is deeply in love with her city, speaks English, French and Spanish fluently and is open to sharing her inside knowledge with the world. Sven, a foodie since 1985, who fell in love with this charming chilanga as well as with her city. His true passions are cooking, traveling and connecting with people from all cultures. Together we feel honored, to share our city with you. As part of the Bikes and Munchies Tour, we are happy to provide a printed map with our 36 personal recommendations for food, culture, drinks & parties. What you can expect are handselected spots around the neigborhoods of Juárez, Centro, Condesa & Roma. The range goes from very tradional to super-hip eats; from program cinemas to secret electro parties, as well as must-see architecture sites.